Niehaus called the first pitch in Mariners history in 1977 — a strike by Diego Segui — and continued calling until their final game of the 2010 season. He died of a heart attack in his Bellevue home Wednesday afternoon. Niehaus, who was known for his exuberant "my oh mys" and home run calls for the ball to "fly, fly away," called 5,284 of the Mariners' 5,385 games in that 34-year span. At the time of his death, he was reportedly the only original employee still with the organization. In 2008, Niehaus received he Ford C. Frick Award, baseball's highest honor for broadcasters, and was inducted into the Hall of Fame. It is not much of a stretch to say that he was universally loved by Seattle fans and players. Ken Griffey, Jr. recalled his first day in the Kingdome after getting drafted in 1987, when Niehaus approached him and said simply, "Hey kid, Dave Niehaus. You are going to be a good one." Jay Buhner told Tacoma's News Tribune that Niehaus "could call a sunset." 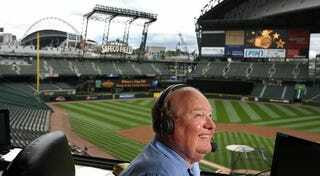 He added, "The booth was his home, and he made you feel every pitch, every play." Today in Seattle, fans are replaying his epic 1995 call for Edgar Martinez's 11th inning double against the Yankees in Game 5. For his voice outside the booth, check out this 2008 interview with Seattle Public Television, in which he tells Enrique Cerna, "I haven't worked a day in my life."